Mini Sets contain multiple related manuals in one ZIP file sized for reasonable download time. RockOla 448; 449; 1488 Service; Schematics. AMI Continental, Mills Evans Century. Orion Sourcebook. Seeburg Symphonola; M100 B; Models F100 G100 H100 Service Manuals. Orion Source Book. Wallbox manual NOT Included. 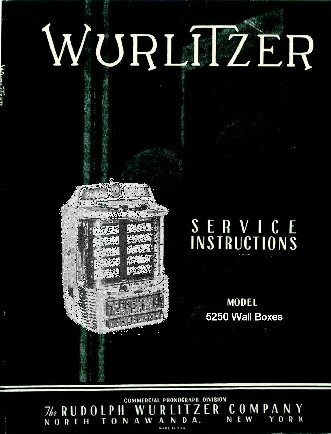 Wurlitzer Series 1500, 1600, 1700, 1800 Service Manuals. 3 Wallbox Manuals. 5206, 5210, 5250 Wall Box and Stepper Service Manuals. Select-O-Matic Model 100B. M100G/F Symphonola 20 Record GEM maintenance manual. 4 Juke and 1 Wall Box manuals plus our usual supplemental manuals. Wurlitzer OMT, 1015 1050 and 3400-3800 Series JukeBoxes on. 16 Juke and 3 Wall Box manuals. 16 Juke and 3 Wall Box manuals in one ZIP FIle. AMI Continental 2 and Rock-Ola 448/449 Juke Manuals Zip Down-Load.